Thinking about getting into fly fishing? Don’t know what to buy? We did all of the work for you. Check out this list of the top fly fishing equipment. Some of it is expensive, but it’s worth it. Quality gear produces higher quality results and exceptional durability over the long term. Quality gear is important for developing proper technique and productively catching fish. It’s very difficult to have fun with equipment that doesn’t work properly or consistently. We looked at everything you will need to get started with fly fishing: rods, reels, tippet, flies, and waders. If price scares you, don’t let our primary recommendations turn you away. For each category of the top gear, we listed a less expensive quality option right alongside the more expensive ones. More expensive equipment is frequently superior. In the fly fishing world you definitely get what you pay for. We picked the Sage Circa 589-4 Fly Rod. Fly fishing is all about feel and, for many fishermen, feel is all about the rod you are using. The Sage Circa 589-4 is likely the best piece of fly fishing gear you can buy. It’s a staple of professional fly fishing kits. The action is slow to moderate, something that goes against what many manufacturers are doing right now. The weight is completely unnoticeable at 2.5 ounces. It casts beautifully. The Sage Circa is more about precision than speed. The truth is, you don’t need speed to catch trout. What you really need is delicacy and skill. If you want cheap, you’re going to have to look elsewhere. Something like the Okuma SLV Graphite Fly Rod can get the job done and provides the right feel for many fishermen at a fraction of the price. The Dragon Fly Reel is the cream of the crop. It might already seem expensive, but it’s a great value because of its performance and durability. This reel is flawless and completely smooth under all conditions. You really get what you pay for. Many people buy for the moment. The smart shoppers buy for a lifetime. The Dragon Fly is actually a bargain for a reel of this quality. Again, something like the Okuma SLV Fly Reel can get close at a lower price, but it will never feel as smooth in experienced hands as the Dragon Fly. Still, the graphite construction provides good response and fast action that makes it easy to get your technique down. We recommend the Okuma S-903-5 Cascade Fly Combo. If you’re just getting into fly fishing but you aren’t ready to spend a fortune then you might want to consider the Cascade combo from Okuma. The kit includes everything you need, matched up, packaged, and ready to go. The Graphite three piece rod is responsive and fast. 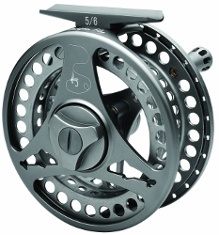 The included Cascade reel comes pre-spooled and ready to fish. The best part about this package is that it doesn’t use cheap components. Inexpensive components have a cheap feel and over time they just fall apart. The Okuma Cascade combo is a cut above the rest and a rarity in a world filled with inexpensive and ineffective knockoffs. If you’re just starting out then this is the brand to go with. In order to find the best fly fishing gear for you, sometimes you have to experiment. This is especially true when it comes to flies. It takes practice and experimentation in order to know what works best for you. So why not have the option to try out 100 different flies? 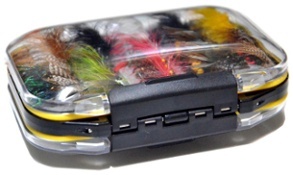 Outdoor Planet’s waterproof pocketed fly box will help you tremendously with your fly fishing. It includes 100 well-made flies, in a variety of different patterns and colors. You will have a lot of fun trying them all out and finding the ones that are most effective. Nothing matches the performance of the Redington Sonic Pro Waders. With multi-layer layers for supreme waterproof breathability, you can be dry and sweat-free all day long. Buying a quality wader is essential. Waders are important for fly fishing because they protect you from the elements. Getting wet can result in deadly hypothermia in the early spring months. Staying dry is a vital part of staying warm while fly fishing. The Sonic Pros will last a long time. If you buy them you will likely not need another pair of waders for at least a decade. But if you are looking for something more affordable, then we do recommend you look into the Redington Crosswater Waders.